When my daughter, son, and I lived in our apartment, we had one cat...Inky. He was pure black, loved to nuzzle,quite a looker and he loved his "mommy" (that was me!). We were good...the four of us. Then one day, after I'd gotten home from work, we kept hearing this horrible meowing outside. Inkers, as we used to call him, was up on the kitchen window sill watching something intently. When I opened the door, there was this raunchy looking filthy cat hugging the outside window sill as if it was afraid of something down below. Then I saw it. This mean looking gray cat with a huge scar across his face. I think he was trying to coax the other down so they could go do the "you know what" (aka the wild thing!). Anyway, I felt bad for the one that was so scared so I went over to the sill, picked her up and brought her in the house. She stunk so badly and was so filthy, I told the kids to just leave her alone, not to touch her and that she could hang out at our house until she was ready to leave. And so she did. After a few days, she really cleaned up nicely. In fact, she was beautiful. Pure white, with the pinkest nose and ears you'd ever want to see. She had adapted well to the kids and to Inkers, too. My daughter wanted to name her Fuchsia. As Christmas approached, we noticed that she had gained weight so we jokingly called her Fatty Fuchsia. Well, one night she was really restless while I was lying on the couch watching TV. The kids were already in bed. She just kept rubbing and rubbing up against the couch trying to get some extra loving. She knew that always worked. I went up to bed and was awakened by my son saying, "mommy, come here...I can't get out of the bed." Then I heard him say, "mommy, come quick, Fatty Fuchsia is having babies all over me." I jumped out of bed and went to his room. When I turned on the light, there lay my poor son...newborn kittens on one side of him and Fatty Fuchsia on the other, giving birth. I told my son that she must have loved him and felt extra safe with him which is why she chose his bed. He didn't really care at that point. He wanted out. I helped my son get out of the bed very carefully so as not to disturb Fuchsia or the babies. Try to picture this...a pure white long haired cat giving birth on a chocolate brown comforter...a brand new chocolate brown comforter no less! 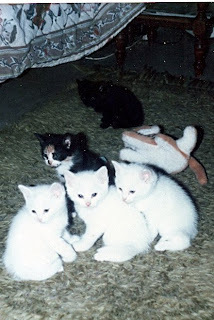 I remember just stroking her head as she went to go clean up one of the kittens, after which she lie back down and to begin laboring once again. I told my son to jump in my bed and go back to sleep. I would keep an eye on Fuchsia, just in case. I honestly don't remember how long it took but when she was done FINALLY, we had five little ones! She was such as good mom, always tending to them. After she cleaned them all up and she wanted to move them into the closest on the floor in my room. She did and as you can see, they were adorable! The kids and I wanted to find good quality homes for these whippersnappers. So, when we found someone that was interested, we had them come to the house so I could interview them. All five got excellent homes most of them went to good friends of mine. oh no!!! cute little fluffy kittens!! how can anyone resist! i like that little blk & wht one!! it's a good thing fuschia had her kittens years ago...cause i might show up at your doorstep to adopt one!! meow!